Facebook is in talks with representatives of advocacy group Mayors Against Illegal Guns and Moms Demand Action for Gun Sense in America, with the social network and its Instagram photo- and video-sharing network being accused of enabling the sale of guns, while maintaining that Facebook and Instagram are not ecommerce platforms. You can’t buy things on Instagram and Facebook, nor can you promote the sale or use of weapons in advertising. We encourage people who come across any illegal activity to report it to us. Mayors Against Illegal Guns was co-founded by former New York Mayor Michael Bloomberg, according to VentureBeat, while Indiana-based mother Shannon Watts started Moms Demand Action for Gun Sense in America the day after the December 2012 Sandy Hook Elementary School massacre in Newton, Conn. Anybody can go to Facebook and Instagram and buy a gun online. We’re asking them to review their policies. They facilitate the sale of guns in the U.S.
(Facebook and Instagram maintaining that they are not ecommerce sites is) one we’ve heard before. We contacted Facebook a few weeks ago and started the petition, which has 90,000 signatures. (Facebook and Instagram are an) unregulated online market for gun transactions. We’re asking them to review their policies. Facebook and Instagram are currently being used to facilitate sales and trades of firearms between private sellers. Most of these sales and trades can take place without background checks, meaning that there’s no way to stop a Facebook or Instagram user from potentially selling a gun to a felon, a domestic abuser, or another dangerous person who would otherwise be prohibited from obtaining a gun. I think of Facebook and Instagram as places to share photos of my kids and family — not as an online market for guns. 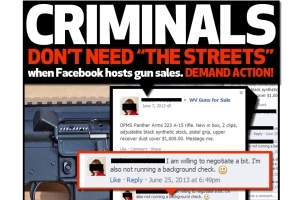 Readers: What can Facebook do to crack down on illegal firearm sales that take place on its network?